On the retirement of Paul Huvenne as director of the Koninklijk Museum voor Schone Kunsten Antwerpen, the museum offered him a surprise friendship album with contributions by 76 colleagues and friends, mainly art historians and artists. The theme, as I reported in the postscript to Schwartzlist 334, was Beelddenken – thinking in images. 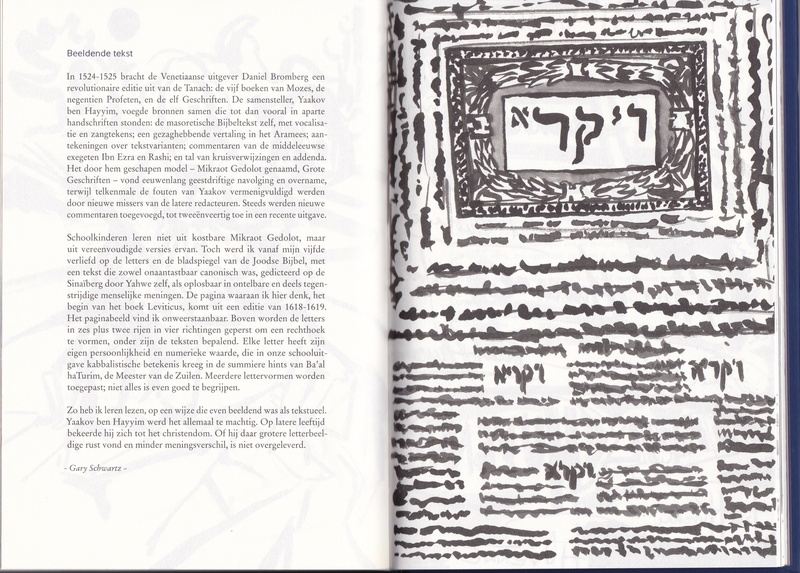 The book opens with Paul’s own definition of the word: “Beelddenken is the ability to form and develop thoughts in wordless images and to picture, express and communicate them directly. In Western culture, thinking in images is the repudiated opponent of thinking in words. This bypasses the fact that most words are image thoughts and that the most abstract concepts are easier imagined than articulated.” The engaging and dedicated young woman who thought up and edited the volume, Katharina van Cauteren, to whom the authors as well as the dedicatee are deeply indebted, asked the contributors to write brief reflections on any visual object of their choice, not necessarily a work of art. My own contribution follows, in translation from the Dutch. In 1524-1525 the Venetian publisher Daniel Bromberg brought out a revolutionary edition of the Tanach – the five books of Moses, the nineteen Prophets and the eleven Writings. The compiler, Yaakov ben Hayyim, joined sources that until then had mainly existed in separate manuscripts and books: the Masoretic text itself, with vocalization and cantillation; an authoritative translation in Aramaic; notes on textual variants; exegeses by the medieval commentators Ibn Ezra and Rashi; and innumerable cross-references and addenda. The model thus created, called Mikraot Gedolot, Large Writings, was imitated and augmented enthusiastically for centuries, with each subsequent editor adding errors of his own to those committed by Yaakov. Commentary was piled on commentary – a recent edition has forty-two. Schoolchildren do not learn from costly copies of a Mikraot Gedolot, but from simplified versions of them. Yet, from the age of five on, I fell in love and stayed in love with the letters and the mise-en-page of the Jewish Bible, with a canonic text that, although it was dictated by Yahwe on Mount Sinai, appeared to be soluble in countless and partially contradictory human opinions. The page of which I am now thinking is the first page of the book of Leviticus from a Basle edition of 1618-1619. The graphic design I find irresistible. At the top of the page majuscules are pressed into six or seven plus two lines (see below), forming a rectangle surrounding a central image that frames the initial word. Below that, it is nothing but the texts themselves, in their varying lengths and formats, that determine the layout. Every letter has its own personality and numerical value. which in our school edition are given kabbalistic meaning in the succinct hints of Ba’al haTurim, the Master of the Columns. A mixture of typefaces and inventive abbreviations are employed; not everything is as intelligible as it might be. That is how I learned to read, in a manner that was as visual as it was textual. For Yaakov ben Hayyim it became a bit too much. Later in life he converted to Christianity. Whether that brought him increased typographic peace and less difference of opinion, has not been entrusted to the historical record. Katharina’s conception of the volume entailed a visual idea of her own. Rather than illustrating the objects in the ordinary way, she had the British artist living in Antwerp, Nick Andrews, create personal interpretations of them. This certainly added to the unity of the book, but it came at a price – a very steep one for my own page, in which the multitude of letters and their form were reduced to general impressions. Honoring Paul Huvenne once more, I illustrate the page from Leviticus that so captivates me. © Gary Schwartz 2014. Published on the Schwartzlist 2 November 2014. With thanks to the Special Collections of the University of Amsterdam library, especially Emile Schrijver. Last weekend CODART enjoyed an advance view of the spectacular exhibition in the Szépmüvészeti Múzeum in Budapest, Rembrandt and the Dutch Golden Age. It is an exhibition that any museum in the world would be proud to show. During a reception at the residence of the Dutch ambassador to Hungary, Gajus Scheltema, the curator of the exhibition, the retired head of the department of Dutch and Flemish painting, Ildikò Ember, was knighted by the ambassador. At the opening of the exhibition, on Thursday evening, 30 October, the Netherlands did itself proud once more when Robert de Groot, Director-General for European Cooperation at the Ministry of Foreign Affairs of the Netherlands, speaking after the president of the dangerously nationalistic Hungarian Parliament, stressed tolerance, democracy and freedom of speech as the main values of seventeenth-century Dutch society, even daring to mention Tahrir Square, Maidan and Gezi Park as new examples of the ways people in the 21st century use the internet to show their will to be free. The catalogue includes an essay I wrote on “The meanings of Rembrandt,” and two entries by my hand, on a late Rembrandt self-portrait in the Uffizi and a Joseph’s dream in the Budapest museum formerly attributed to Rembrandt. Visiting Budapest, especially as an honored guest, always moves me deeply, following the flight of my grandparents from anti-Semitic Hungary in 1923, with their five children, among them my mother, then seven years old. Responses are always welcome and will be answered. So are and will donations.